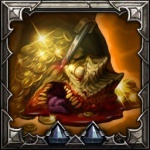 The Treasure Goblin is a harmless monster type first found in Diablo 3. Goblins (or Gobbies) are found randomly scattered around the dungeons and Rifts. Goblins do not attack players or deal any damage, but they often create dangerous situations by leading pursuing players into fresh enemies. Goblins are classified as "Demons," and are "Unique" enemies, with purple names and non-random properties. As Elites they take extra damage from +Damage to Elite modifiers, and killing a Goblin will reset the bonus timer on the Bane of the Powerful Legendary Gem. He'll randomly and rarely appear in dungeons, but when he does you'll want to beat the candy out of him as he'll drop progressively better loot with each hit. Don't let him escape! Goblins are generally found one at a time, though certain community buffs have caused them to always spawn in pairs. Players will rarely encounter a large group of 6-12 goblins of the same type, in a Nephalem Rift. Diablo 3 debuted with just the one basic type of Treasure Goblin, though their drop rate and item quality was buffed and their AI tweaked in patches. Reaper of Souls made no initial changes to Goblins, but Patch 2.1 added the bonus treasure land Greed's Domain reached only through a Goblin portal and Rainbow Goblins, Patch 2.1.2 introduced four additional types of Goblins. and Patch 2.2 three more. All types of goblins (except Rainbow) may open a portal to Greed's Domain, the Treasure Vault level. Three new types of Goblins. The following types of goblins are found only in Reaper of Souls, and not in regulation Diablo 3. All except for the Rainbow Goblin are only present in Adventure Mode, but no goblins can be found in Greater Rifts. Leaves open portal to Whimsydale, the "secret" area. Drops Blood Shards while running, and multiple stacks of Blood Shards upon death. He does not drop any gold or items. May drop orange legendary or green item set crafting plans. Blacksmithing specific drops only. No gold or gems. Drops only gems while running and a huge stack (20-25 gems) upon death. Gems are of the same quality as monsters/chests drop at the level, thus at level 70 (the maximum in Reaper of Souls) the gems are about 90% Marquise and 10% Imperial. Drops gold and items when he runs, has a short range teleport when fleeing, and drops more and better quality than a normal goblin. Players will usually get a legendary item from his item fountain. Just gold, and lots of it! Drops better quality than a normal Goblin. Ends up with 7-9 tiny GS goblins, all of which move quickly and drop like a normal goblin when killed. All types of Goblins can be found one at a time, in normal games, only in Adventure Mode (except for the Rainbow Goblin, who can also appear in Campaign mode). In Nephalem Rifts, players will not find any Rainbow Goblins, but the other types of Goblin will sometimes very rarely be found in large clusters of 6-12 (sometimes 10 - 20) which creates wild scrambles as the Goblins scatter in every direction, dropping loot as they run. Goblins appear with their portal open, as an aid to seeing them. Once activated by a character hitting them or moving into close proximity, Goblins will run, and if they stop and are not touched for several seconds they will open the portal again, and jump through it if they remain undisturbed for around ten seconds. Mixed type pack of Goblins. Patch 2.1.2 PTR, Dec 2014. The time the portal stays open before the Goblin leaps through will grow shorter each time the goblin opens or the longer the battle runs -- Goblins must be killed quickly or else they will escape. Goblins have been made easier to kill since they debuted with Diablo 3, and made to pause longer before escaping. They may even go back into their resting mode if activated and then left undisturbed without any characters nearby, and will wait indefinitely until they are encountered again. Goblins not in a Rift will sometimes leave a golden portal behind when they die, granting players in the game access to Greed's Domain, a treasure level full of gold and gems. This portal to The Vault occurs randomly; it is not affected by allowing a Treasure Goblin to live longer, or trying to kill a Goblin just before it escapes through the portal it opens during the combat. Rainbow Goblins are a special type of Treasure Goblin that may leave open a rainbow portal that takes players to a bonus area called Whimsydale, which is identical in size and layout to the rainbow-themed Whimsyshire easter egg level. Whimsyshire vs. Whimsydale are not the same level -- players who enter this portal and Whimsyshire the normal way in the same game will clear out two different areas -- but the monsters found there and the rewards earned are effectively identical. As of Patch 2.1.1, the new types of Goblins, the Blood Thief, Odious Collector, Gem Hoarder, and Malevolent Tormentor, may also leave open a golden portal to The Vault just like a normal Treasure Goblin. The secret level is the same in all cases, and the portals opened by the new types of Goblins are the same golden color, though fans have suggested their portals should be palette shifted to match the color of the different goblin types. The Treasure Goblin was first revealed in the playable demo at Blizzcon 2010. The developers were clearly proud of their new addition to the game, making numerous jokes about chasing and "beating the candy" out of the Goblin. The initial version of the Goblin, seen pre-release and then in Diablo 3 vanilla, was harder to notice since he did not show up on the map, didn't stand beside and open portal, made no warning sound, and the text window messages about "engaged an Elite" didn't yet exist in the game. Goblins could also activate while still a long distance from the player, and were often hit accidentally by ranged attacks or sought out by Followers. These factors often caused players to miss goblins, or not notice them until they saw the trail of gold, too late to chase after the Goblin that had dropped it. Goblins also moved faster and paused less often during the combat, and had a much shorter delay before they opened their portal and then hopped through it. Since the initial version of the game every aspect of Goblin hunting has been relaxed. They are now much more visible with a map icon, give out a warning sound when players draw near, pause more often during the chase, wait longer before vanishing through their portal, go back to a sleep mode if they run away and are not pursued, and so forth. The Treasure Goblin seems to have taken its inspiration from the Golden Axe video game series, where between levels the players would sleep in a camp, and be awakened by thieving goblins with large sacks of loot over their shoulders. Another likely influence was The Thief character seen in arcade classic Gauntlet, a small chuckling character who raced around the dungeon and would steal power ups from characters who didn't kill him in time. The story info about Goblins was initially provided by Abd al-Hazir in a Lore entry heard when a Goblin is first encountered. "Some devious little goblins have been robbing our merchants! When pursued, they simply open portals and disappear with a most aggravating chuckle. The peasantry seem to believe that the goblins serve a great demon lord known as Greed and furthermore, that their portals lead to Greed's domain! A ludicrous notion, truly." This lore was expanded on post-Reaper of Souls release, when The Vault bonus area was added, a golden portal to which only goblins can create. 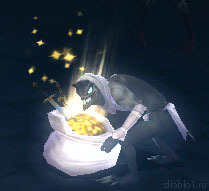 The Treasure Goblin was briefly discussed during the 2010 Blizzcon Crafting Sanctuary Panel, where the developers urged players to "beat the candy out of him" if and when we spotted the little guy. 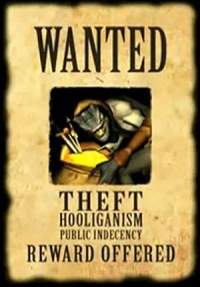 They also presented a wanted poster with his face on it; a useful presentation since it's tough to get a clear look at his visage in the actual game. Most players assumed the Goblin was was humanoid; like a twisted old man, but judging from the wanted poster he's some sort of demonic rat-like creature. Assorted Treasure Goblin screenshots and concept arts. See every piece of Treasure Goblin media in the Image Gallery. Concept art by Victor Lee. A mob of Odious Collectors drop all the plans. News articles about The Vault. First sighting from the PTR. Blizzard blog with concept art. This page was last edited on 7 December 2016, at 19:18.